A regular reader recently e-mailed me a link for the Center for Inquiry. Everything I know about them, I learned from their about page and website http://www.centerforinquiry.net. To oppose and supplant the mythological narratives of the past, and the dogmas of the present, the world needs an institution devoted to promoting science, reason, freedom of inquiry, and humanist values. The Center for Inquiry is that institution. I like their mission, we need more science, reason and inquiry. Humanistic values are a good thing to promote as well. I also like how they clearly enumerate their goals – goals I happen to agree with. Growing up in and leaving Christian Science, I have been both directly and indirectly influenced by religion, pseudoscience, and the stigma of my non-belief. Christian Science has done it’s best to work into the upper echelons of government, and has been lobbying congress since forever. I’ve been fairly quiet about my non-belief/path away from Christian Science around certain family members and many of my friends – there are those who understand (may of whom have escaped), and then there are those who are “disappointed” or who have accused me of throwing away the greatest gift I’ve ever been given. It can be lonely being “out” and not everyone understands. 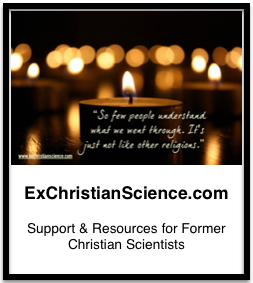 There are tons of atheist blogs, dozens of former fundamentalist blogs (including niche fundamentalist blogs like former home schoolers), questioning Christians, decidedly former Christians, Humanistic Pagans, but very very few former Christian Scientists (except for those who have found Jesus and occupy space over at Christian Way). I’m not sure if I’d find what I’m looking for at a Center for Inquiry, although to be fair, I’m still not sure, what I’m looking for, but I’m enjoying the journey, and I don’t live near enough to a Center for Inquiry easily visit. I suppose I’ll have to settle for adding a podcast or two to my regular listening, The Human Bible looks like it could be interesting. I was also pointed to a YouTube video on “Women Leaving Religion” Panel from CFI’s Women in Secularism 2 Conference 2013. While there are no former Christian Scientists on the panel, It is fascinating to hear about the other women’s experiences, and their paths away from the religions they’ve been raised in. I liked their perspective on what it meant to be “authentic” in the religious culture and who enforces it, how it is enforced, and what we see (it starts about 30 minutes in). It is really amazing, and I plan to check out the other Center For Inquiry videos. Totally unrelated to everything else, I think they’ve just become my new favorite holiday-card supplier, although I still really like these (for more holiday ranting, you can read my post: The Perfect Christmas). Policy at Principia: What are they afraid of? I relate so much to the sometime loneliness of being “out” of Christian Science myself. I so wish sometimes I could sit down for coffee or drinks with someone who won’t look at me like I just grew two heads when I talk about my experiences in Christian Science. A few of my cousins who grew up nominally “in the faith” fill the void sometimes, but even they are so much farther removed than I am, and they never were all that deep into it. Such is the dilemma of a refugee from an obscure religion. Thanks for telling your story here! Aw, thanks. I’m so grateful for the little LJ communities, but yes, it would be wonderful to be able to meet up with someone in person every now and then!